Perhaps in a very roundabout way, in summing up John Deere’s journey, I have summed up my own. 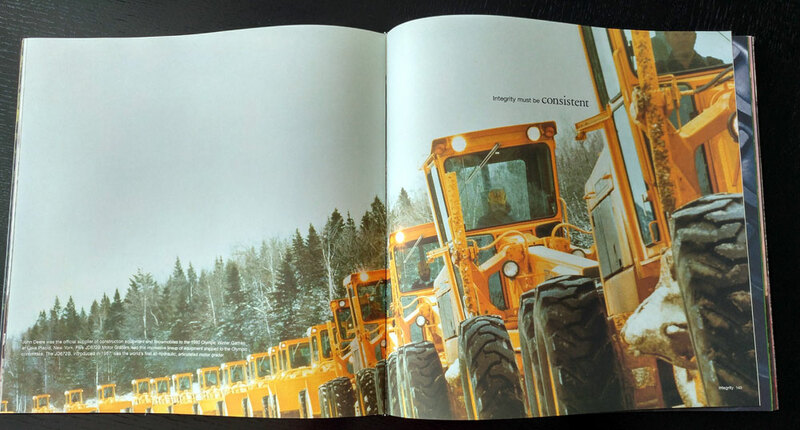 About two years ago I traded the hyped and buzzy world of Internet and intranet communication for the opportunity to create a corporate coffee-table book for John Deere, my employer of 30 years. Why not,? I naively thought, as I accepted the assignment offered by my boss and the CEO (truly an offer I couldn’t refuse). I was ready to take a break from Internet warp speed and get back to my corporate print roots. The chance to produce something physically real like a book instead of something so ethereal as a Website sounded way cool. Of course I had no idea of what I was stepping into. 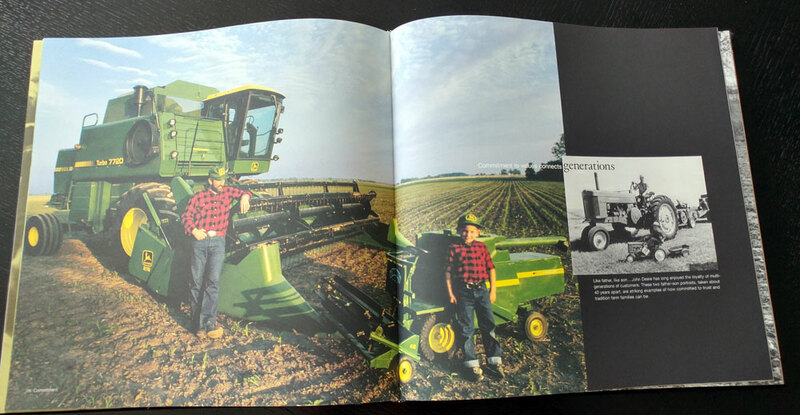 Genuine Value: The John Deere Journey is the 286-page, 4-pound coffee-table book that was birthed over an 18-month gestation period. Looking back, I would have to say this was truly one of – if not the — crowning corporate communication project of my career. (And this is not to denigrate any of the other things I’ve enjoyed doing … from launching and editing JD Journal, John Deere’s now 29-year-old corporate magazine, to building an internal communications program from scratch, to helping launch John Deere’s Website and intranet). Genuine Value simply put everything I thought I had already learned to a wonderfully-engrossing, extended and intense test. Birthing a book is exhilarating, scary, exciting, tedious, fun and painful. Strange, but I now find myself relating very well with pregnant women. Believing that the corporate history book genre is a very powerful and underutilized branding and culture-building tool, I have tried to gather together this pamphlet of experiences and observations for anyone who may have the good fortune (or bad, depending on how it goes) to manage a similar corporate book project. 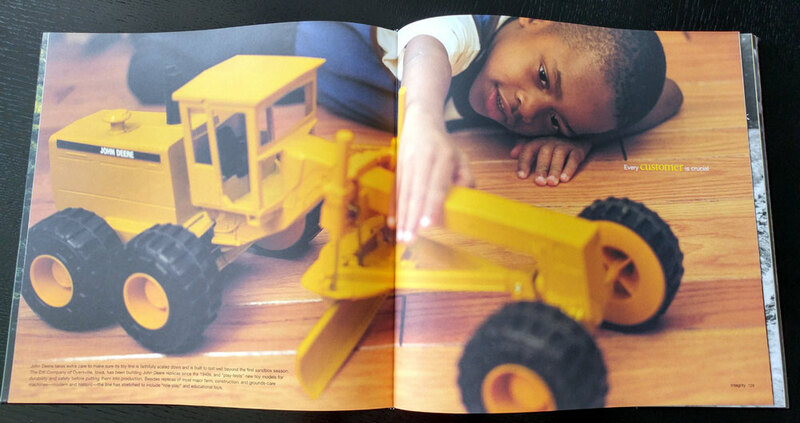 To give you a flavor for the book, I am reusing some of the spreads and text titles from the book to introduce each section of this journey behind The John Deere Journey. There are as many approaches to corporate history books as there are corporations. Our daunting first questions were: How do you capture the essence of a company like John Deere (5th oldest publicly-traded company in America, $13 billion sales, 45,000 employees, dozens of different businesses)? And how do you do it in a way that would interest not only employees, retirees and dealers, but a much broader audience including college customers, students, investors and the general public? We knew the definitive Deere history book had already been done by Prof. Wayne Broehl, a Dartmouth College historian, who wrote the now out-of-print 870-page tome titled John Deere’s Company (Doubleday, 1984). We certainly didn’t want to re-invent this perfectly cast wheel. We settled on the coffee-table format because we wanted a book that would boldly illuminate aspects of the company difficult to capture in words. We knew the amazingly large and well-organized John Deere Archives contained a treasure of wonderful images, many never-published. 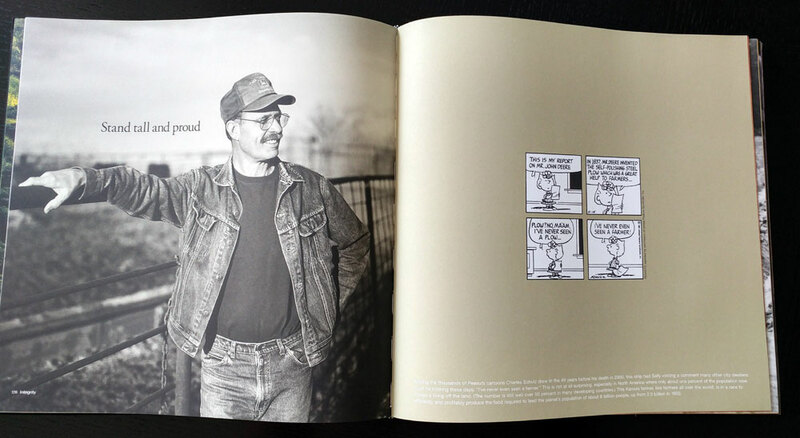 By pairing these with lean text, we thought we might entice our internal and external audiences for the book to see this venerable old American icon company in a new light. 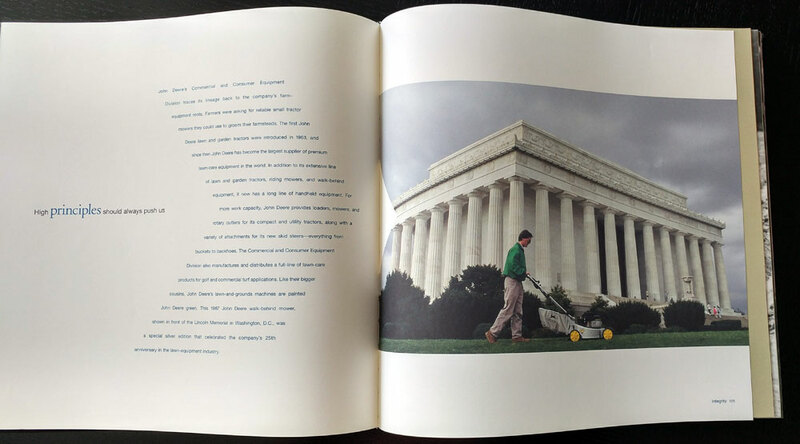 I’ll never forget the first planning meeting for the book with Hans Becherer, Deere chairman. We showed him a selection of coffee-table books that we felt were close in style to the book we had in mind. After a long review and much silence he said, “These are nice, but I think we’ll need a lot more text.” We knew then that this was going to be a delicate operation. Attract enough media attention for the book to get it marketed through national book chains and online retailers. We prototyped four different concepts for the book. All were interesting in their own way, but idea #4 – to focus the book on values – resonated like a hammer striking a steel plow. The idea was that the values Mr. John Deere lived by are still alive in the company today, and that has made all the difference. Indeed, Deere’s history is filled with great value stories. For example, during the height of the U.S. Great Depression of the 1930s, the Deere & Company board of directors decided to carry, as long as necessary, thousands of farm customers who were hopelessly behind on their farm-machinery debts. Eventually nearly 100 percent of all these past-due debts were paid, and the company still enjoys an amazing amount of customer loyalty due to that single humanitarian decision. After getting strong buy-in for the values approach, we immediately hit a huge question: What were the core Deere values that we should build the book on? Although John Deere has always been a value-oriented company, and there are references to values sprinkled through company literature, no one had ever zeroed in on the specific value words. The book, Built To Last, by James Collins and Jerry Porrass, makes that point that visionary companies almost religiously preserve their core ideology – and it is usually expressed in six values or less. And so for awhile, the book project became a values project. We set out to answer the question that Collins and Porrass say all successful visionary companies must answer: What do we actually value deep down to our toes?” After an exhaustive review of policy and vision statements, speeches, bulletins, videos, etc., we had gleaned a list of 37 values that best expressed the John Deere way of operating. With a series of employee focus groups, we trimmed the list to 19, and then with the help of some top executives, to the final four: Quality, Innovation, Integrity and Commitment. Finally, we could start engineering the book. Regarding the quality of any printed piece, I can only say that you achieve it like a mountain climber conquers Mt. Everest. You attack the mountain one step at a time; you sometimes reach too broadly, you fall into crevices, you curse the mountain, but you never lose sight of your original vision: the peak. And you learn every day that you’re only as good as the team you are climbing with. And we probably all suffered a bit each time one of us would question the choice of a photograph, or a sentence, or the placement of a text block, or the type size, etc., ad infinitum. Megan Kearny, designer, used a wonderful line to combat some of my more creative graphic design suggestions. “John,” she would say after a long silence. “That simply wouldn’t make any sense.” And all of us would always laugh and move on. Gaining the trust and support of top management for a project that stretched the company’s staid image was one of the more challenging and rewarding aspects of Genuine Value. Fortunately, for this project the stars were perfectly aligned. My boss, Curt Linke, Corporate Communications VP, had the courage to allow some of our most creative (or should I say off-the-wall?) spreads see the light of day in offices larger than his. Hans Becherer, and in later stages, our current CEO, Bob Lane, were not only generously supportive; they also contributed very valuable feedback and ideas that helped us reach an even broader vision for the book. Hans Becherer urged us to create a concise, reader- friendly timeline spanning the company’s first 163 years. We commissioned Gene Ritzinger and Roy Harrington, two very knowledgeable retirees, to write this section. A flip through this 44-page section gives you a snapshot of what major developments were taking place, the amazing evolution of products that were being introduced, who was running the company, revenue, earnings and employment numbers. Because there’s so much to do, and so many ways to do it, and so little time, it’s easy for a book project to start looking and sounding like a marching band run amuck. Just the “administrivia” (writing the technical specs for printing, finding and identifying photos, routing text for approvals, securing rights, etc., etc.) is bound to cause a few sour notes and whines. If you’re blessed to be part of a creative, fun-loving, dedicated and quality-minded band, praise the Lord and keep marching. Tim Beck, production manager, who with his computer analyst background devised systematic computer processes and amazing spreadsheets that helped keep us conquer the production mountain and keep us on deadline. Tim also managed the monumental task of working with HR departments worldwide to gather the master database used to print, in one chapter, the names of all 63,876 current John Deere employees and living retirees. (Not recommended for the faint of heart). Michael McMillan, art director, (designer of Michael Jordan’s best-selling photo-autobiography Rare Air) and his McMillan Associates team, were absolute joys to work with. Michael has a zany, natural ability to deliver creative solutions in the face of the darkest downpour of deadlines – and still make it fun. From Michael I learned much about graphic design and philosophy. His favorite book is Zen and the Art of Motorcycle Maintenance, and Michael can convince you the book tells you all you need to know about achieving quality in an organization. Michael is one of those rare art directors who firmly believe graphic design must be founded on conceptual ideas that ring true to the client’s culture and identity. And best, he has a way of allowing a word-image person like me to cast cold water on one of his designs … and he doesn’t get defensive. Rare air indeed. Megan Kearney, designer, was right out of design school but you would have never guessed it from her sure and mature sense of esthetics and a work ethic that certainly equals any of her dotcom peers. She had to render all those revisions, including painstakingly retouching dozens of little pieces of straw out of the soil cover photograph. No wonder Megan turned a cartwheel in front of the Heidelberg press as we signed off on the last press proof of the book (and I have a picture to prove it). Since this was a company-wide project, we listed more than a 100 other John Deere employees worldwide that assisted us in big and little ways, most notably the Archives and Corporate Communications staff. 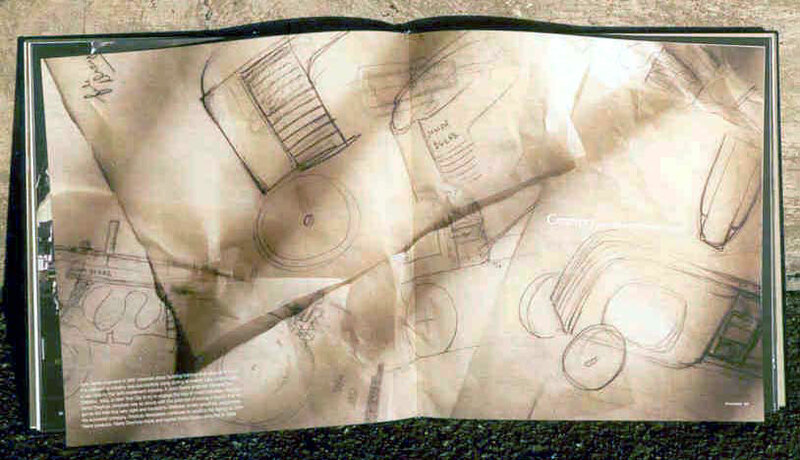 We soon realized the journey behind The John Deere Journey was really only about half over when the shrink-wrapped hard-cover books starting shipping out of the Graphic Arts Center bindery in Portland, Oregon. Sensitive to the other cost-containment measures the company was taking in 2000, we decided to sell the book rather than give it away, as many corporations do. This meant that the book team immediately had to launch and manage a not-so-small international book business. Oh the book business! What a wonderfully mystifying and in many ways eccentric business that we knew virtually nothing about. Fortunately, the book trade seems to contain a high percentage of extremely nice people who generously shared their wisdom and pointed us toward possible paths. If you ever get a chance to attend the annual Chicago Book Expo, don’t miss it. In an amazing blur of several months we did everything we could to get the word out to our internal audiences. We staged a press conference at Deere headquarters where Hans Becherer presented signed copies of the book to the oldest living retiree (97 years old) and newest employee listed in the names section of the book. We launched an e-commerce Website (www.genuinevalue.com). We lined up an order-fulfillment company to take and ship Internet, mail and phone orders. We created a direct mail marketing piece for employees, dealers and suppliers worldwide (translated into six languages). We designed an order-form envelope for inserting into internal magazines. To encourage dealers to retail the book, we created a complete book marketing kit that included a counter-top display, a poster, brochure, and book marketing tips. And to keep the book in front of employees, we published a series of Genuine Value Tidbits on our intranet, and reprinted images from the book on the back cover of JD Journal magazine. The last step, just completed, was to find a publisher (Motorbooks, Inc.) to handle external marketing of the book for the 2001 Christmas season. And I’ve started doing newspaper, magazine, radio and TV interviews, about two-dozen so far. Speaking from experience, most corporate communication projects are simply created and “thrown over the wall.” Too often, there’s no time or budget to measure how the piece impacts your audience. Because Genuine Value is being marketed (employees, retirees, dealers and suppliers can buy the book at cost), we have weekly sales reports to show how the book is doing. It is both amazing and gratifying to report that we have sold nearly 35,000 copies of the book to date, and we’re just beginning to tap external sales and look at public relations opportunities. 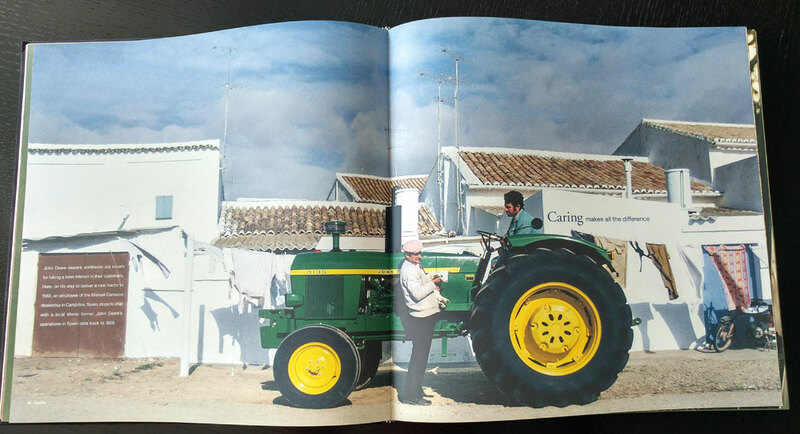 The book has started to be deployed in many unique ways to extend the John Deere brand, and win new customers and employees. One division purchased 800 books to give to their most-prized customers as a loyalty-building tool. Recruiting is using the book to help land new hires and build a bond with student interns. Potential partners and customers in new developing markets such as India and the Ukraine are learning about the scope of John Deere through the book. 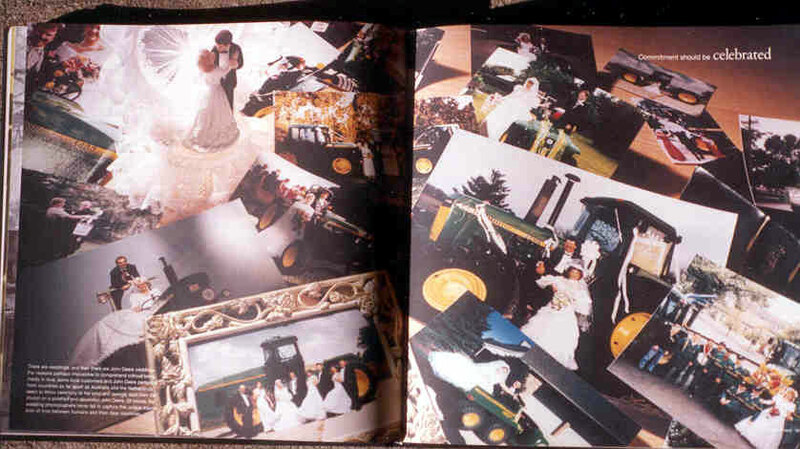 John Deere employees in China opted to be given the book instead of their traditional service award gifts. And dealers are coming up with novel marketing incentive programs that use the book (i.e., buy or service a machine, get a book). Can a corporate history book sell machinery? Hmmm. There’s nothing quite like birthing a book to send you into postpartum reflection. You hold up your baby (in my case, 4-pounds, 286-pages), and scrutinize it to make sure it has no flaws. After 18 hard months of labor, I wanted our newborn to embody the words of its great grandfather, John Deere, who said: “I will never put my name on a product that does not have in it the best that is in me.” I wanted Genuine Value to truly beam with Quality, Innovation, Integrity, and Commitment. Looking back and ahead: Change is constant, but values are enduring. These are the only words on the last spread of the values section of the book. In my reflective mode, I began mulling these words in the context of my career – 32 years of constant change and challenge – all within the same company. What kept me here through all the normal ups and downs any career offers? Could I be one small statistic proving that the thesis of Genuine Value rings true … that values do make a big difference? Focusing deeper on that question, I was drawn to take another look at the My Life & Times chapter of the book, subtitled: “The John Deere Story: A fictional memoir based on historical facts as interpreted by John Gerstner.” This was by far the most fun chapter I wrote, for the simple fact that I put myself in John Deere’s shoes, and wrote it as he might have 164 years ago. 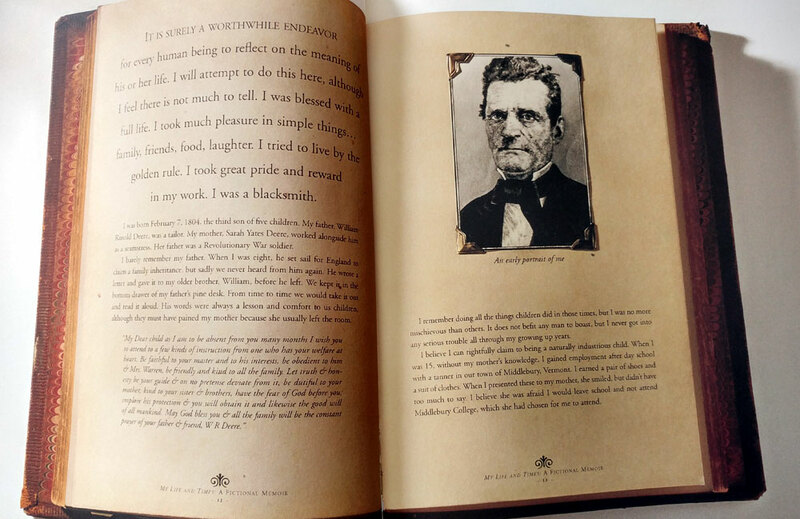 The chapter is also visually interesting because we literally created a book within a book. The end result looked so real that we took the precaution of placing the words, “A Fictional Memoir,” on each page of the chapter. We certainly didn’t want to mislead readers in a book about integrity. Editor’s Note: John Gerstner is now Manager, Corporate Environmental & Safety Communications. He can be reached at gerstnerjohnj [at] johndeere [dot] com. 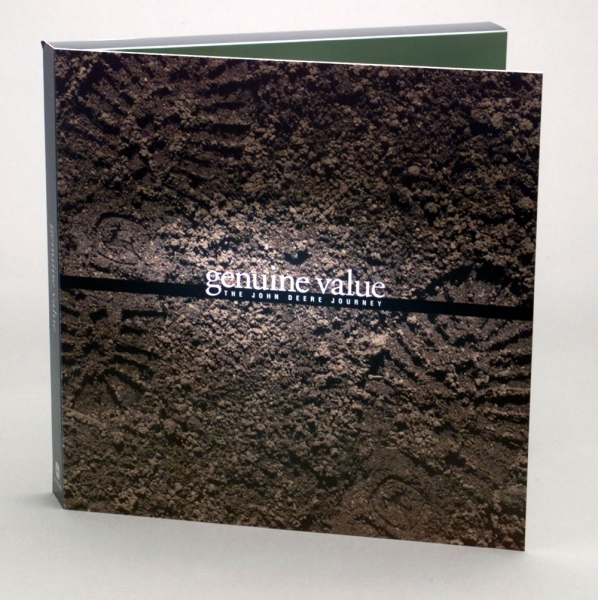 Genuine Value was named Best Coffee Table Book of 2001 by the Independent Book Publishers Association. Genuine Value also received two IABC Gold Quill Awards, an Advertising Club of America Addy Award for packaging, plus several graphic design and printing awards. The book can be ordered at www.genuinevalue.com or by calling 1-800-455.1174.